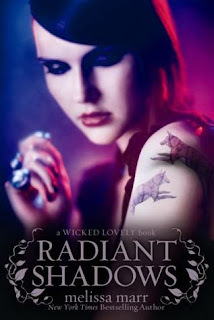 This fourth (and, according to my library catalog, penultimate) installment in the Wicked Lovely series focuses on two new characters. The first is a half-human, half faery girl named Ani. Her mother was human, and her father is the leader of the ferocious, feared Hellhounds. Ani is unusual in that she can feed both on blood and human emotion, and her uniqueness brings her to the attention of some of the most dangerous elements of Faerie. Then there is Devlin, the High Queen's brother and assassin, who becomes involved, finding himself inexplicably drawn to the half-fae girl. He experiences a rare division in his loyalty to the queen. The queen, out of love for Seth (a main character in the previous book) is losing the cool, logical demeanor that has always been her primary characteristic, and her emotionalism seems to be throwing Faerie out of balance. Her twin sister, Bananach, the embodiment of chaos and war, is only two happy about the state of affairs and sees Ani as a means to achieve her ends. Ani is bound and determined to make her own choices and keep herself safe, but it seems matters are quickly escalating. If it sounds complicated and confusing, that's because this is the fourth book of the series, and while each novel contains a single, complete story, these stories are woven together in a way that moves the overarching narrative toward a much larger conclusion. This novel certainly shakes things up, and while I am typically reluctant to get to know new characters when the focus shifts from previous ones that I've come to care about, with Marr's books it never takes me long to become wrapped up in the story and to care about the new characters as well. I enjoyed the interplay of the various factions who are often at cross-purposes because their natures are so diametrically opposed, even though at times they seem to have similar goals. There were aspects of the plot (explanations of certain key elements) that remained a bit vague, which made the motives of certain characters a bit puzzling to me, but I am hopeful things will be explained in the next, and apparently final, book of the series. I enjoyed this one quite a bit, although Wicked Lovely and Ink Exchange remain my favorites, and I would recommend this to both teens and adults. Fyrefly's Book Blog: "I particularly liked they way Marr used her characters to play with the idea of balance, of order and disorder, of containing two opposing truths within one person (or one faery)." My Friend Amy: "I love the way [Marr] paints a scene, the way in which she allows us to experience her characters through their emotions and longing. I love this world so full of darkness and valiant struggle." The Story Siren: "The plot is just so intricately woven... just wow. I was impressed by the entire novel... writing, plot, characters. Everything was right on." The cover for the last book was revealed a couple of weeks ago. I started buying these books because of their covers. I still have not finished Fragile Eternity because it was so repetitive. :( I should though because everyone has said that Radiant Shadows is the one I SHOULD read. Cat - I think Fragile Eternity is probably the least memorable, but there are pieces to the puzzle (I'm assuming) from each book that will be necessary to understand the conclusion. The buildup is huge - I have pretty high expectations at this point! Somehow reading the books as they are published builds my expectations to a higher level (because of the wait, I guess) than when I read through a series that's already published. Ladytink - I think that is a good move - since the books focus on such different characters, it'll be easier to keep track of what's going on if you read them all at once. It always takes me a while to figure out what has happened and who everyone is when I start a new book! This was my favorite since Wicked Lovely, although I don't think any of them is ever going to quite measure up to the first. (Not enough Donia!) I'll be interested to see how she ties everything together in the last book. Fyrefly - I feel exactly the same way!